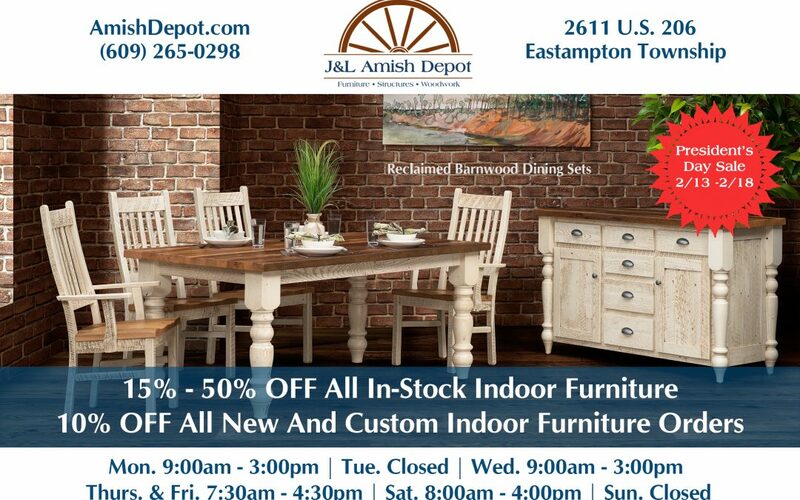 Our customers are our lifeblood at J&L Amish Depot, which is why it is our mission to pass as much value as we can to everyone who visits us in Eastampton. On all of our items, we pass along as much of the savings to all of our customers. In addition to our normal pricing, we occasionally have an opportunity to reduce our normal prices or we will do so just to celebrate a holiday. 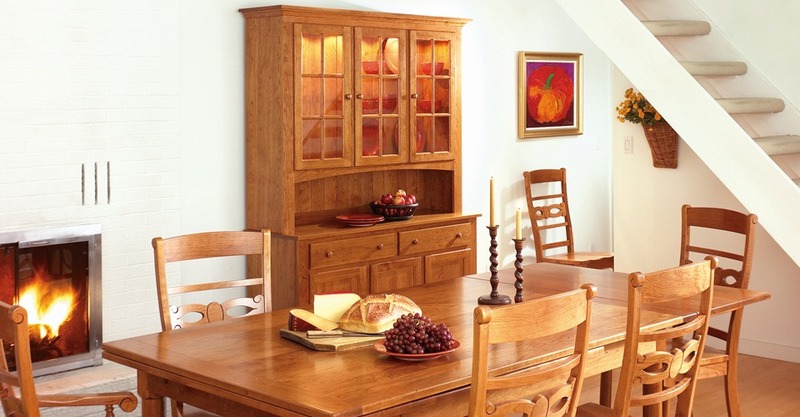 Below, you will find special offers, price reductions and sale prices on our quality Amish-made furniture and structures. 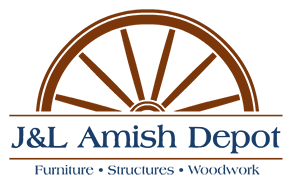 Everything at J&L Amish Depot is created with the same care and attention to detail. Just because we can offer a special price or an item is on sale does not mean that it is made any differently than any of the other furniture or structure that we provide. Everything is handmade by Amish craftsmen using traditional building methods and techniques. Our goal is to provide authentic and affordable quality to South Jersey. 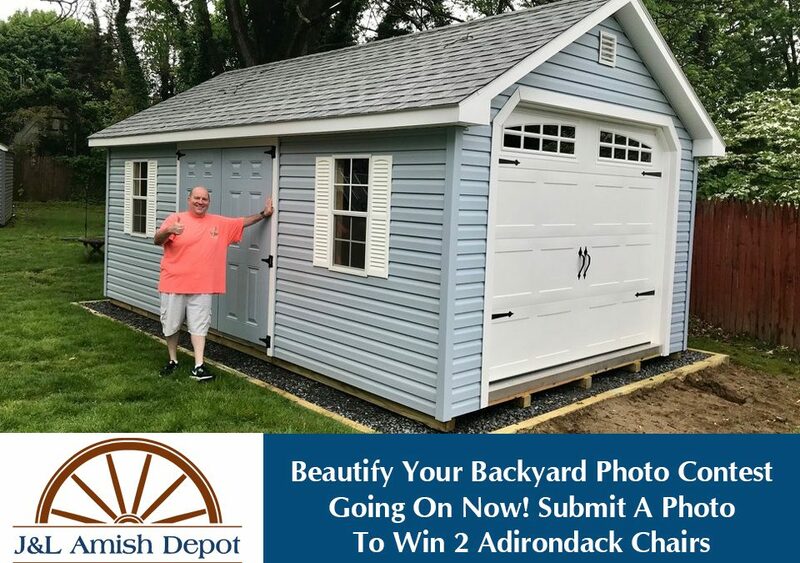 See below, sign up for our email list or follow us on Facebook for sale details. The savings continue with our Presidents’ Day Weekend Sale with up to 50% OFF our wide selection of Indoor Furniture February 13 – 18. Take 15% – 50% OFF All In-stock Dining Room, Living Room, Home and Office Furniture items and 10% OFF All New and Custom Indoor Furniture orders. 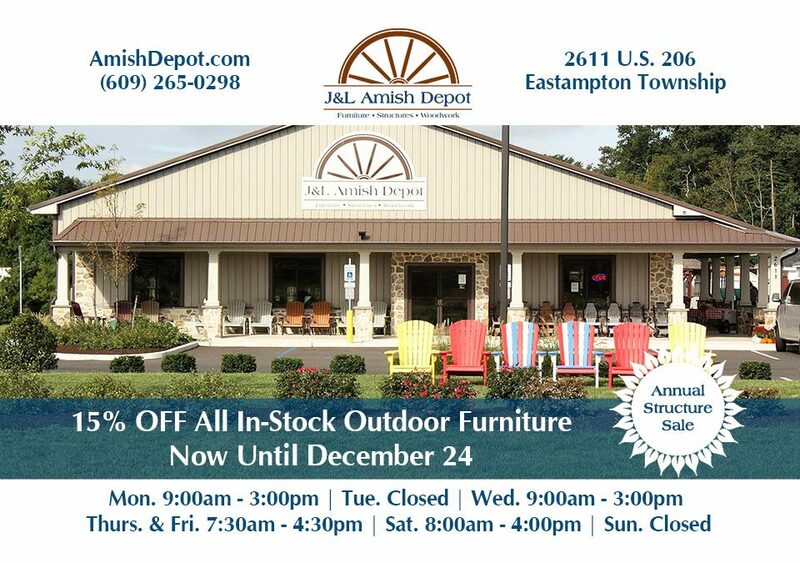 Now through December 24, 2018 stop into our store for 15% OFF all In-stock Outdoor Furniture. 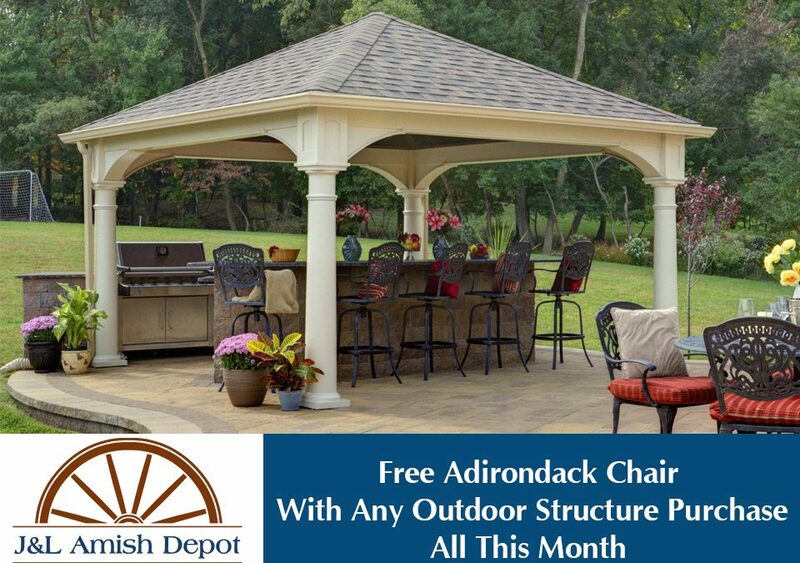 All of our outdoor furniture is Amish made and built to last and we have hundreds of pieces in stock. Choose from tables, chairs, benches, rockers, dining sets, bars and more. While you are here take a look at our selection of Amish made crafts and gifts for all ages or add a few items to your wish list. Happy Holidays from all of us at J&L Amish Depot. 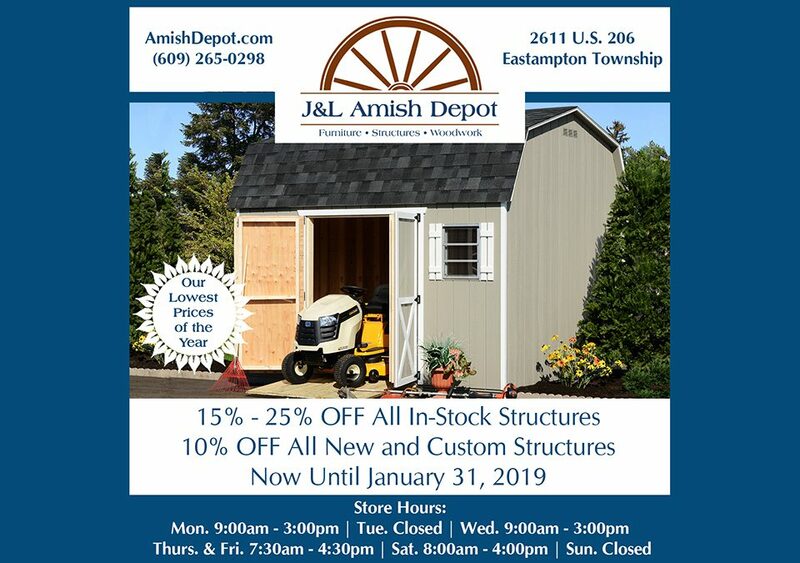 It has been almost one full year since J&L Amish Depot has opened its doors at a new standalone location on Route 206 in Eastampton Township. Join us in celebrating the occasion at our second annual Harvest and Heritage festival 10 a.m.-3 p.m. Saturday, September 15 at our store. 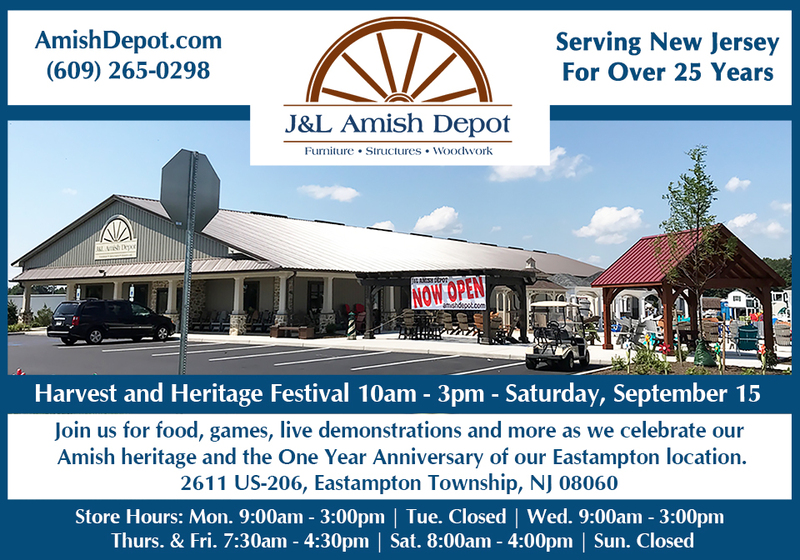 Stop in and allow us to show you our appreciation for your business with food, games, live demonstrations and a celebration of our Amish heritage.